Which countries are on the right track, according to their citizens? Is the country you live in on the right track? If your answer is no, then you’re in good company. 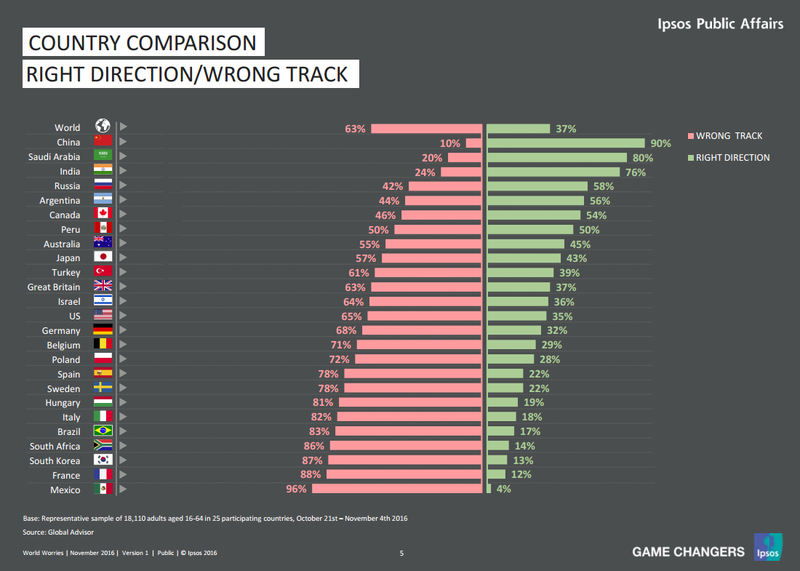 Nearly two thirds of people around the world believe their country is heading in the wrong direction. This is according to Ipsos/Mori’s ‘What Worries the World’ survey, which questions thousands of people in 25 nations. Between October and November 2016, the percentage of people who believe things are on the right track in their country dropped by 2 percentage points to 37% globally. The Asia Pacific region and the BRIC economies tend to be more optimistic, while people in the other regions are more likely to take a negative stance. People in Latin America and Europe are particularly pessimistic about their nations’ fortunes. China is bucking the trend with 90% of people expressing confidence in their country’s direction, followed by Saudi Arabia (80%). More than three quarters of Indians and just under six in ten people in Russia and Argentina also believe their country is on the right track. Brazil is the notable exception among the BRICs nations with only 17% believing the country is heading in the right direction. In Asia, South Korea is an outlier too. Just 13% of its citizens have faith in the country’s trajectory. Among the Western nations, Canadians are the only people with a predominantly positive outlook (54%). The US is in the midfield, despite a small month-on-month drop in confidence from 37% to 35%. However, the survey was conducted before the presidential election, and the mood may have changed. 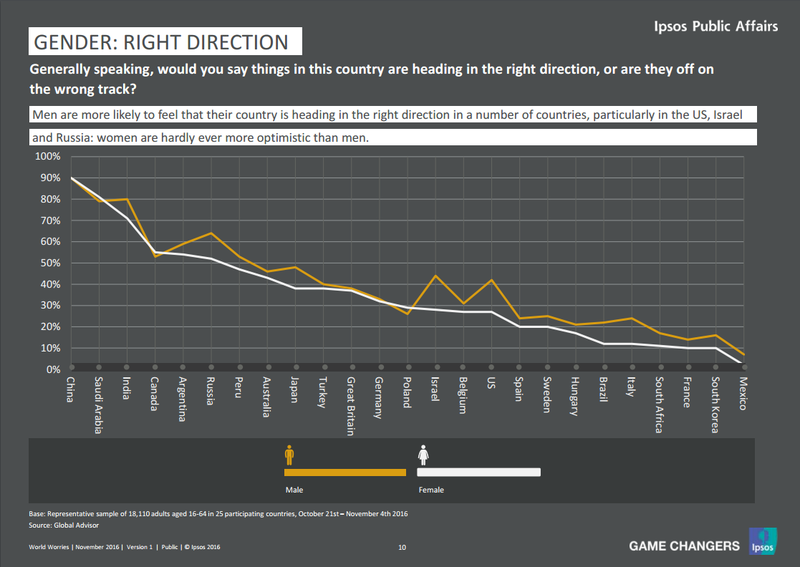 France and Mexico bring up the rear as their citizens have the least confidence in their country’s direction: 88% and 96% of the populace respectively believe that their country is on the wrong track. A gender split suggests that, globally, men are more optimistic about their nations’ direction than women, with the biggest gender confidence gaps in the US, Israel and Russia. The Ipsos/Mori poll also explores the concerns at the heart of people’s growing discontent. By far the greatest worry is employment, which was highlighted by 38% of all respondents. This has been a constant theme ever since the poll was launched in 2010, when 51% of citizens highlighted it as a concern. Today, Spain (70%) and Italy (65%) are the countries which worry most about unemployment. Next in line are concerns about poverty and social equality (38% globally). These are felt most strongly in Hungary (56%) and Russia (52%), but are also the top concern for Germans, Belgians and Japanese citizens. The third most common concern globally is financial and political corruption (30%). South Korea stands out as the country which is most anxious about this. Since June, Ipsos/Mori has recorded an increase of 19 percentage points to 73% overall, in the wake of a corruption scandal. 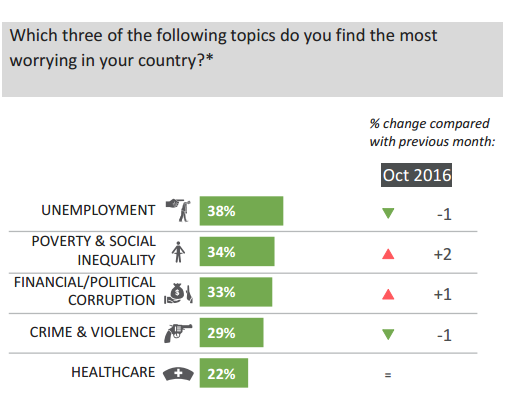 Crime and violence, along with healthcare, make up the remainder of the top five concerns across the globe. The Latin American countries are more concerned than the rest of the world about crime and violence, in particular Peru, Mexico and Argentina. Fear of terrorism preoccupies Turkey while Hungarians are most concerned about healthcare. Education continues to be a concern for many countries, in particular in Latin America. Peru stands out at 41%, but there were also big increases of nine percentage points in Sweden and five in Israel. Immigration is a lesser concern globally (19%) but it is the top concern in Great Britain (38%), having increased by two percentage points. It was the only country for which immigration is the biggest worry, with Germany following close behind (37%). Increases between two and four percentage points were also recorded in Italy – which saw a 4% rise - France, Belgium and Canada. Moral decline features highly in China (39%), though it is worth noting that Chinese respondents in the survey were not shown the full list of topics. Men and women in each country tended to be aligned in their concerns, though Ipsos/Mori note a tendency for women to be more concerned about healthcare.